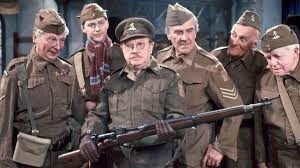 Very sad to hear about the death of Dad’s Army creator Jimmy Perry on Sunday. Exactly one year ago to the day I was sitting with him in his living room doing some sound recording work for Radio 4. He talked me through all of his memorabilia and told me how the ideas for his tv shows had come from his time during the war, whilst tea kept arriving. This entry was tagged dads army, hi de hi, jimmy perry. Bookmark the permalink.